Repeat rows 1-10 as desired. Bind off after a row 10. European magazines were on a different trajectory. Faced with readers in different countries all speaking different languages, European patterns used charts. One set of symbol explanations in all different languages--a sort of knitter's Rosetta stone--took up only part of one page, and then the same charts could be used by anyone from Norway to Spain. By comparison, a magazine or pattern booklet with complete written instructions duplicated in Dutch, Swedish, French, German, Portuguese would have been a heavyweight tome (not to mention, a nightmare of translation). Both methods--written instructions and charted patterns--have their admirers, and both have their detractors. It isn't very hard to find people passionately taking sides, just look at the archives of nearly any knitting forum, and quite a few blogs. The written pattern advocates say (with accuracy) that you can't really knit directly from a chart, you have to reduce the pattern to words first ("knit, let's see, 1,2, ah ha! 3 stitches, next we have a yo, then knit 2 together, and do that, uh, let's see, 7 times, or, wait a minute... 8 times....") So why, they ask, go through a translation process of turning the picture into words, and then knitting from the words. Why not just start with the words? That helps avoid translation errors. And all those little symbols--so hard to read and keep track of! The advocates of diagrams say (also with accuracy) that unless you have a diagram, you have no idea how the whole thing fits together. A diagram lets you see instantly how any part of the pattern relates to the whole--it is more intuitive, more visual. With written instructions, if you're making a mistake, you won't know it for a long time, because written instructions have no feedback loop--no physical representation--with which you can compare your work. It might be four or five pattern repeats before you become familiar enough with the pattern to figure out what the problem is, supposing you don't quit in disgust first. So, are written instructions better than charts, or are charts better than written instructions? My answer is "yes." They're both better--but better at different things. For me, however, the very best way is neither a written instruction nor a chart--it is a third method. This method is a short-hand combination of written instructions and charted diagrams, a method which I call "the chart of the chart," or "chart-chart" for short (as in: "The chart-chart for Grandmother's Lace Edging is below"). With a chart-chart, the pattern is reduced to its essentials. Yet, for me at least, the pattern is not obscured because the repeats are made very clear. The chart-chart has to be custom made by you, after an analysis of the pattern, which means you have to get down and dirty with your pattern, you have to wallow in it a little--and this has the additional benefit of fixing the pattern in your mind. On this particular "chart-chart," each row of the pattern is laid out. For example, on row 1, there is to be 1 selvedge stitch followed by 21 plain stitches, for a total of 22 stitches. On row 2, there is to be nothing but 22 plain stitches. On row 3, there is to be one selvedge stitch, then 2 stitches knitted plain, and then 8 repeats of a yo/k2tog sequence, then 1 repeat of a double yarn over/k2tog/k1 sequence, for a total of 23 stitches. On row 4, there are to be three knit stitches, followed by a purl stitch, and the row is to end with 19 knit stitches, for a total of 23 stitches, and so on and so on. The chart-chart is keyed to the regular chart, and to the word instructions if there are any. If you forget what a "plain stitch" is in the context of the chart-chart, you go back to the original printed pattern. After just a couple of repeats, however, your chart-chart takes over. The biggest advantage is that you don't have to keep running your finger along row 3 to count stitches, yo's and k2tog's, again and again and again. Other advantages: Chart-charts read normally--from upper left to lower right, the same as regular text--so you are not faced with reversing everything and reading from lower right to upper left, as in a charted diagram. A chart-chart takes up far less room than word instructions or a big pattern, it's easier to keep track of where you are, and it supplants all the aggravating counting and re-counting of little squares. In sum, it's a short-hand combination of word instructions and chart instructions. To make your own chart-chart, you have to look at the original chart (or written instructions) to see what elements of the work are repeated, and how the work is constructed. In Grandmother's Lace Edging, the creation of the lace itself is made up of 3 repeated lace rows: rows 3, 5 and 7. Each of these lace rows features eight combinations of yo followed by k2tog. This yo/k2tog combination make the "holes" of the lace. Each yo is an increase, but because it is immediately followed by a k2tog decrease, the fabric remains the same length through these 8 repeats. 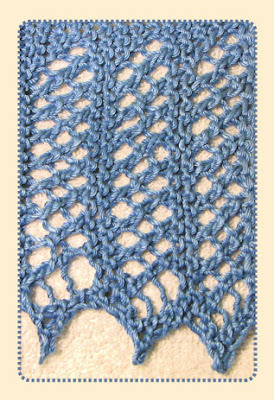 The holes in the three lace rows are offset from one another by starting each lace row one stitch lower than the previous one. This allows the lace holes of row 5 to fit between the holes of rows 3 and 7--the same way a honeycomb is constructed. The pattern makes a wave at the lower edge by a series of stepped increases. At the lower portion of each of rows 3, 5 and 7, a double yarn over (2 increases) is followed by only a single k2tog (one decrease). This lengthens the work by one stitch at each of these three lace rows. These three lace rows of increasing length are followed by a correction--the work is bound off three stitches and returns to its original length, several rows of plain knitting are interspersed, then the 3-lace-row pattern begins again. To make the chart-chart, you have to analyse, then provide for all these repeated elements. Every odd row starts with a slipped selvedge stitch, so you start by putting in a chart column for that. 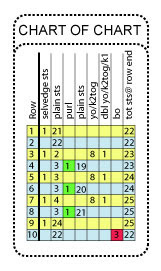 Every row, whether odd or even, begins with at least some plain stitches, so the chart-chart gets a column for plain stitches. The even rows after a lace column get a purl stitch, because on encountering the double yo on the trip "up" the work, you knit into it, then purl into it. So, you put in a chart column for the purl stitch. This purl stitch is followed by a whole bunch of plain stitches, so another chart column must be provided for those plain stitches. Rows 3, 5 and 7 are the lace rows--and the chart columns reflect the lace elements--the yo/k2tog combinations, as well as the double yo/k2tog/k1 element which ends each lace row. The three bind-off stitches get their own chart column--there they are in row 10. I've also chosen to add a column which shows the total number of stitches there ought to be on the needles at the end of every row, and this gives me ammunition to quiet that little nagging part of my brain insisting that I better go back and check each row, because I might have missed a stitch somewhere. Also, per the illustration, you can see that you don't HAVE to chose to keep the chart columns in the same order as the work. For example, in row 10, 3 stitches are bound off--and this occurs before the 22 remaining plain stitches. But the bind off occurs only once in the whole pattern. Instead of distracting myself by making the first chart column for bind off, and having it empty all the way down to the last pattern row, I chose to make it that second-to-last chart column, and to try to remember that the 3 bind offs come before the 22 plain stitches. There are no conventions for chart-charts. While it's easiest to read if you put the columns of the chart-chart in the same order as you'll encounter the stitches on your needle, you're free to make up your own exceptions when you determine the order of the columns. This sample chart-chart is color-keyed to the original chart--the same colors mean the same things--green for the purl, red for the decrease bind-off, yellow for knitting on the front, blue for knitting on the back, and so on. This wouldn't be hard to do by hand with colored pencils, but you might find it is unnecessary--truthfully, the chart-chart in the illustration is the most beautiful one I've ever made, usually they are little notes on scrap paper, looking more like a tic-tac-toe board than a knitting pattern. As will occur to you, chart-charts aren't restricted to lace knitting. Any knitted fabric with repeating design elements (texture knitting, color knitting) can be put into chart-chart form. Addendum, 2013: Knitpicks Blog posted a Kelley Petkun podcast interview with me about Chart-Charts. Hear it here. Opening illustration: Grandmother's Lace Edging for a baby blanket, Patton's "Grace" Cotton Yarn, size 5 needles.